Bullish sentiment ticked back up this week to 37.7% after falling to 33.5% last week. This comes as the S&P 500 has traded above its 50-DMA for a week now. 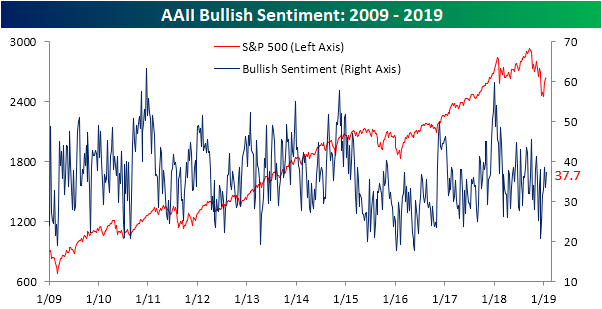 The weekly investor sentiment survey conducted by AAII has come off of extremely low levels from the late 2018 sell-off and has maintained above 30% readings for all of 2019 so far. This jump in bullish sentiment is still slightly lower than the historical average and where we were only a couple weeks ago (38.5%). Bearish sentiment fell 4% this week down to 32.3%. 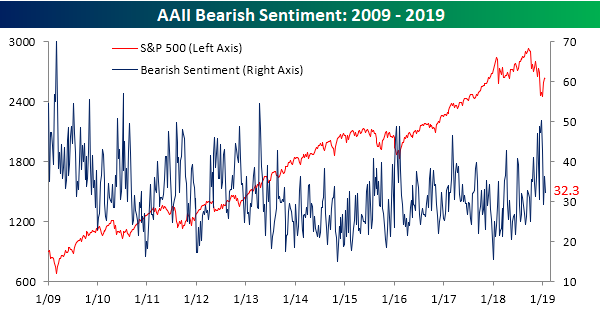 Bearish sentiment has fallen off of extremely elevated levels following the Christmas Eve sell-off. While it has fallen, bearish sentiment remains above the historical average of 30.5%, though not by much. 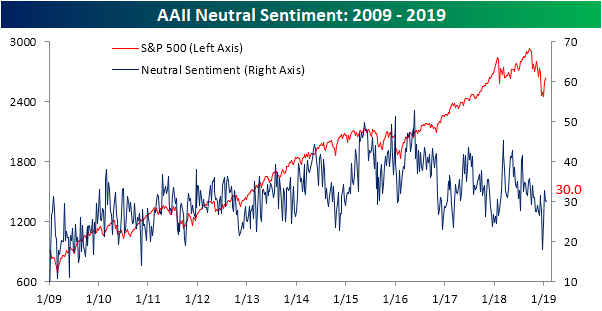 Neutral sentiment has remained essentially unchanged at 30% this week. Given this, the gain in the bullish camp seems to have entirely come from those with formerly pessimistic outlooks.